He has made numerous appearances on BET’s Comic View. Benji appeared in Laffapalooza hosted by Academy Award Winner Jamie Foxx and brought the laughs to Nick Cannon’s Wild n’ Out on MTV. He was featured on ESPN’s Cold Pizza; and performed in 1st Amendment Stand Up presented by Martin Lawrence on STARZ; and guest starred on the first season of BET’s hit reality show College Hill. Audiences across the nation have been treated to Benji’s range of characters, including his most popular character “Kiki,” as he hosts the Fort Lauderdale, Miami and West Palm Beach Improvs. “He’s an actor doing comedy,” says comedian Mike Epps. 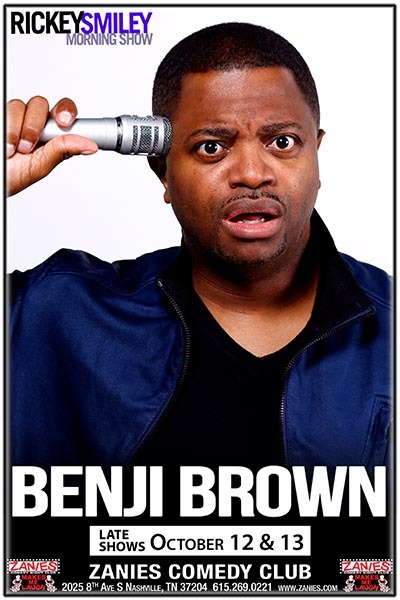 Benji performed on Tyler Perry’s Meet the Browns Tour and has worked alongside a list of headliners including Chris Rock, Steve Harvey, Rickey Smiley and Monique. He co-starred in a series of 2005 Bud Light Super Bowl Commercials with Cedric the Entertainer. The Sunshine State Product can be heard every morning as the star personality on Cox Radio WEDR 99 Jamz. Benji recently wrapped on his second DVD feature film, Benji Brown – The Breakthrough, the highly anticipated sequel to the top selling comedy film In Touch With Reality, directed by Melvin James. He also starred in a hip-hop comedy, A Miami Tail, released by Lions Gate Films. Dedicated to the community, Benji is a regular host at celebrity and charity events and is currently the reigning Annual Zo’s Summer Groove Comedian, one of the largest community events in Miami hosted by Alonzo Mourning and Dwyane Wade.